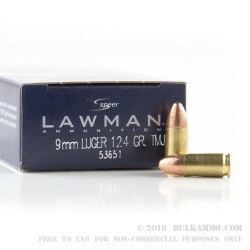 If you spend most of your training time shooting targets at an indoor range, this 9mm ammo by Speer Lawman will be a great addition to your range bag. 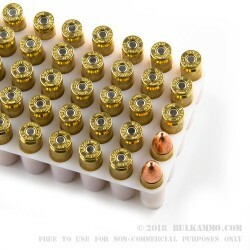 These American-made 9mm cartridges feature 124gr total metal jacket (TMJ) projectiles with zero exposed lead at the base. These TMJ bullets fire clean, produce minimal fouling and cut down on lead pollution in the air that is common with FMJ projectiles. With a muzzle velocity of 1090 fps and a muzzle energy of 327 ft/lbs, this 9mm ammo has the feel of proper self-defense ammunition which will help you practice for real-life situations. Speer uses Boxer-primed brass casings that are non-corrosive and reloadable. This ammo is non-magnetic. Don't waste your valuable training time with shoddy ammo from a no-name company. Speer was established in 1943, and their ammo is trusted by law enforcement all over the country. Order your 1000-round bulk case of this 9mm Speer ammo today! This ammo worked very well in my 1911 Colt Competition pistol, shooting 7/8" groups from a sandbag rest at 20 yards. They go 'bang' every time. Not sure if I got a bad batch or what. Working with customer support, I thought they would have heard other reports like this, but they say no. Almost every other round fails to eject from my nearly-brand-new Sig 226 Stainless Elite (500 rounds through it). It shoots everything else I've tried with no problem, including other low-priced ammo. Cleaning & oiling the Sig make no difference. Bought 1000 Speer 124g to break in 2 new hand guns. 750 rounds were cycled through a S&W M&P Pro and 200 more through a Baretta Nano. The S&W performed flawless and the Nano had 2 fte. I'm learning the Nano has a reputation for fte. A: Hello Al, Speer lists the muzzle velocity of this 124 grain round at 1090 fps. Q: What is the RN on the end of this products name? A: RN stands for "Round Nose". Some manufacturers will use this term while others may leave it out. Round Nose can be applied to most full metal jacket rounds in this caliber. When you think of a typical bullet shape, this is round nose. A non round nose bullet would include any JHP--Jacketed Hollow Point as well as most .40 S&W rounds which feature a flat point. If you have any additional questions, please feel free to respond via e mail or give us a call. We will be happy to help. Q: What is the difference between TMJ & FMJ? A: When inspecting a TMJ and FMJ round in hand, there will not be an apparent difference between the two rounds. The TMJ (total metal jacket) includes the same copper metal finish on the base of the bullet as all other sides of the bullet. This base is the portion that faces the powder. This covers the lead core which is normally exposed on traditional FMJ (full metal jacket) bullets. This cover reduces lead dust upon discharge and is desirable for indoor ranges. Neither FMJ or TMJ will appear to show a difference in accuracy.